Remember this? : Calling all gullible gamblers! Prize draw'? Marketing for 'investors'? It’s also covered in the NZ Herald. Something else to add to the demonstrated track record of Sean Wood and his business partner Steve Goodey. Spruikers, if you ask me. PS How sweet to see that expert in financial hyperbole Dean Letfus putting in an emailed plug for Steve Goodey recently. 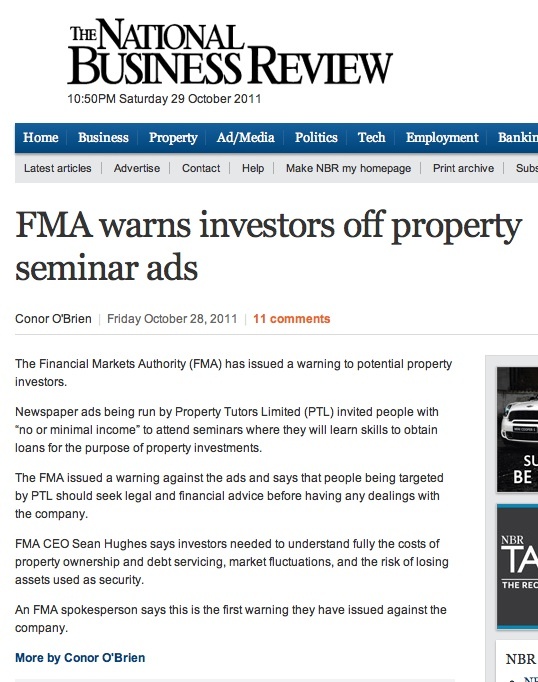 The Financial Markets Authority (FMA) has issued a warning to potential property investors. Newspaper ads being run by Property Tutors Limited (PTL) invited people with “no or minimal income” to attend seminars where they will learn skills to obtain loans for the purpose of property investments. 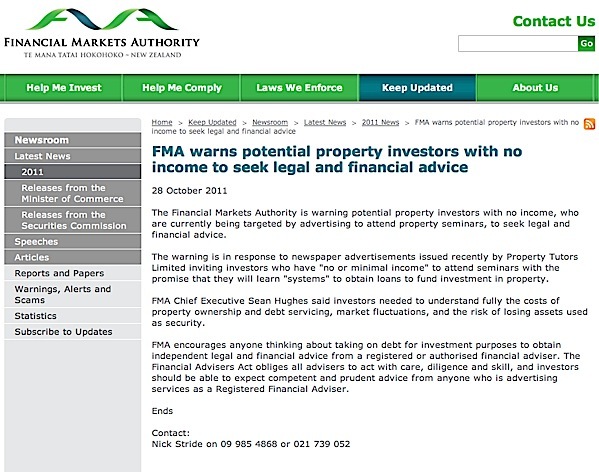 The FMA issued a warning against the ads and says that people being targeted by PTL should seek legal and financial advice before having any dealings with the company. FMA CEO Sean Hughes says investors needed to understand fully the costs of property ownership and debt servicing, market fluctuations, and the risk of losing assets used as security. An FMA spokesperson says this is the first warning they have issued against the company. Something about this doesn’t seem right. 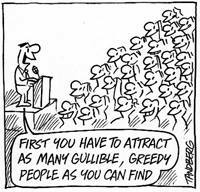 They only want property investors with no income to attend? It seems to me, that if I were peddling lies for money, I think I’d want people with actual income to attend. Dunno. But it’s instructive that the regulatory body felt the need to specifically pick Sean Wood’s marketing and activities out for a public warning. God knows what the FMA — if it had existed — would have made of his and Steve Goodey’s er… activities and methods during their time spruiking for the Richmastery enterprise. Or Blue Peak ‘Wealth Management'(cough). Even worse. These guys have always struck me as pretty low on the leopard-spot-change coefficient. Is the FMA not clear about what personalized financial advice an Registered Financial Adviser can give in comparison to an Authorised Financial Adviser? The PTL Directors are Registered Financial Advisers, so nothying to worry about right? All financial advisers must be registered on the Financial Service Providers Register (www.fspr.govt.nz). In addition, FMA licenses and monitors Authorised Financial Advisers and Qualifying Financial Entities. Only Authorised Financial Advisers and Qualifying Financial Entities can offer personalised advice on complex investment products. Financial advisers are people who give advice about financial products. They include financial planners, brokers and people working for banks and building societies who provide advice about money and investing. Advisers hold different types of licences and this affects the kind of advice they can provide. There are different types of financial advisers. Can advise on simpler products like insurance, bank term deposits, and mortgages. 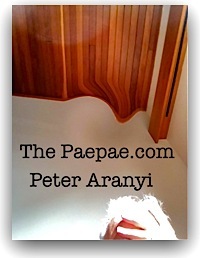 Can advise you on the same products as RFAs and investment products like KiwiSaver or managed funds. But they can only advise you on the investment products provided by their company. Have met minimum qualification requirements and must comply with professional standards. They can advise on more complex investment products and can also offer investment management and investment planning services. Their licence will set out the types of products and services they are authorised to offer. There’s also a criminal and background check component … e.g. people with fraud or other convictions etc will be subject to extra scrutiny. And there’s also a ‘good character’ component ..
failure to manage business or personal debts or financial affairs satisfactorily. Who is going to issue a warning that the FMA is encouraging the public to obtain independent advise from a Registered Financial Adviser (RFA) for investment purpose when an RFA has no license from the FMA to give advice on such matters? 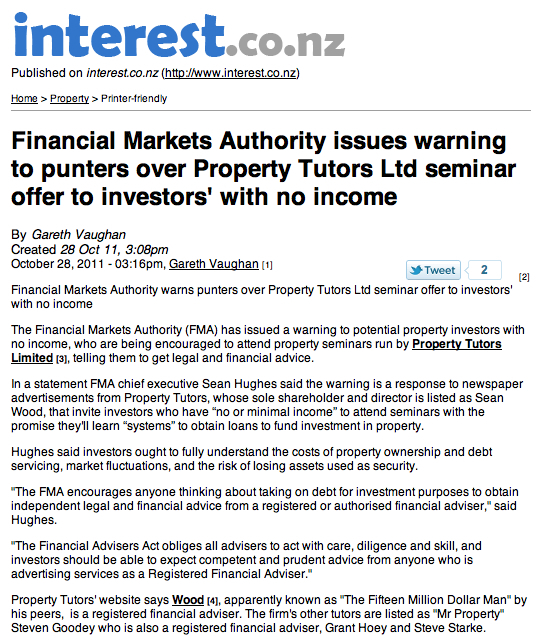 What happened to Property tutor now. when i went to the seminar few years ago – Don ha was with them as well who now known to be bankrupt. after lot of talk the key message was give up 25+ks to mentor you where they have their set of real state agents, builder, Accountants who will also rip you off at each transaction. it was a great money making scheme for them though. Well, with a harsh view like that, I guess you didn’t sign up? No doubt the promoters of the scheme have many success stories they could point prospective clients towards. In the end, it’s up to each of us to make our own investment decisions.